We can learn from Mises in this respect too. "How one carries on in the face of unavoidable catastrophe is a matter of temperament," wrote Ludwig von Mises in his private memoir of his life in Europe. It was true in his time and it is true in ours. This new translation and edition of Mises's moving account of his life, published by the Mises Institute, provides not only deeply fascinating personal history; it also functions as a moral and spiritual guide for any lover of liberty during times of despotism. It was written during and after his immigration to the United States in 1940. Despite being driven from his home, seeing his country taken over by a foreign dictator, having his books burned and his papers stolen, and finally pushed out of the sanctuary he had for six years, he never lost determination and never doubted the truth of liberty. "Again and again I had met with situations from which rational deliberation found no means of escape; but then the unexpected intervened, and with it came salvation. I would not lose courage even now. I wanted to do everything an economist could do. I would not tire in saying what I knew to be true." Mises wrote his memoirs and then promptly locked up the manuscript. He had good reason. Many of the politicians and intellectuals he exposed were still alive. Much of the jaw-dropping detail had never been revealed. He figured it would have to wait until after his death. He was 59-years old, and a political exile, first from Vienna (fleeing the Nazi takeover) and then from Geneva. He had been camped out in Switzerland for six years, teaching and writing the masterpiece that would later become Human Action. But he had been warned that some people wanted him turned in. He had to find a new home. Leaving Geneva, he and his wife Margit drove across France, just in front of the advancing German army. They barely made it out. There was no professorship waiting for him in the United States. He had lost everything. His library had been burned. His papers were missing. He had no money. He would have to start over, writing and speaking in a new language. Making this transition would require all his moral courage. As he looked back over his life, he wrote the most moving, personal work ever to bear his name. It is one of the most inspiring books ever written by an intellectual—and it happens to be by one of the greatest intellectuals of all time. There is anger in this book but also inspiration. What strikes the reader is how Mises never lost his focus on the battle of ideas. The enemies in this book are bad ideas. The answer, however, is not war or revolution or a new form of rule. For him, the path to liberty is through the right ideas. In this sense, this book is incredibly high minded, revealing his nobility and intellectual commitments to truth. Mises writes about his time as an economic advisor to Austrian officials; his battles against Bolshevism and the inflationism; and his attempts to prevent New Deal-like policies in Europe. He talks about his teaching and his seminar. He discusses corrupt politicians and central bankers, and all the shills for statism in academia and the media. He had almost singlehandedly stopped a Bolshevik takeover, and stopped Austria from following Germany into the inflationist abyss. And here he even writes of his one regret—that he compromised more than he should have! The vault that held Mises's manuscript wasn't opened until after his death. He died in 1973. A German translation appeared. F.A. Hayek wrote the introduction. Four years ago, we commissioned a new translation that preserves his idiom and precision. The results are spectacular. Mises's memoirs have come alive as never before. With all the interest generated by the Mises biography that came out in 2008, and with the current political trends in the United States, this is a perfect time to examine Mises's own autobiography. Mises inspires us with his moral example. He tells of his strategy and teaching methods. "In my seminar, I seized every opportunity to refute popular errors." Truth is it own standard, he believed. He talks of his private seminar and the culture it fostered. "Outsiders knew nothing of our gatherings; they saw only the published works of individual participants." They didn't cultivate a sect or society; rather they were "united in the desire to further the sciences of human action. Each was free to go the way his own law guided him." He blasts the enemies of freedom. Of the German Historical School he writes that it "did not produce a single thought. It did not write a single page in the history of science. For eighty years it eagerly propagandized for National Socialism." Further, its members were so unprincipled that "they would have become communists had the Bolshevists come to the fore." Finally, he admits to feelings of despair: "From time to time I entertained the hope that my writings would bear practical fruit and point policy in the right direction…. I set out to be a reformer, but only became the historian of decline." Even with such feelings, he never gave in. He kept writing and teaching. And what a glorious legacy he left! In this prose, we have profound determination—moral determination. It wasn't enough that he was a genius of a scientist, that he made earth-shattering contributions to economics, history, philosophy, and more. What made the difference for him was character. This is why Murray Rothbard wrote that he was not only a scholar but a hero, an example to us all. We need more like him. But in order to have that, his example needs to be there for everyone. Guido Hulsmann writes the preface. F.A. Hayek writes the introduction. Arlene Oost-Zinner did the translation. But the book itself is pure Mises, writing his deepest and most private thoughts, now available to the world as an example, a model, and an ideal. from New Orleans Great book, if a bit short. After being warned about the "anger" in this book, I braced myself for an uncomfortable read. Fortunately, such an event never happened; I never found Mises to get out-of-hand at all. Instead, I found a great book that helped me better understand Mises and his growth as an economist. 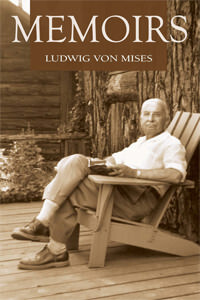 With that said, I still wish Mises had written more about himself.